Non-Profits are deceiving their innocent supporters and donors. Non-Profits’ have huge salaries, much more than the minimum wage. And they also have more daily allowance for their expenses even personal expenses. Non-Profits are professional employees. Money is their main goal. The cause is just a means to have a lucrative employment. Often they do 1% of their advertised cause only. Volunteers have to spend their own money to be volunteers. From travel expenses, meal expenses, lodging expenses, and other expenses. Volunteers do not use your donation for these expenses but their own hard earned money. Volunteers are not salary-takers. The cause is their main goal. So who are these Non-Profits (Liberty Tramplers) and at the same time living luxuriously on donations? Who exposed these Non-Profits (Liberty Tramplers) on their frauds and wrong doings? Below are four 2011 articles that I found interesting and full of information to fight our oppressor on your sports of cockfighting. Not to mention animal domestication or farming. Please take time to read them. Thank you. Time to Call the Feds? As Chicagoans are discovering this week, Illinois politics is full of surprises. And we just got one of our own. My blood boils when I see you, the consumer, bilked out of your hard earned money by appealing to your sense of compassion and kindness. No one wants to see an animal starved and we all get a good feeling sending that money to such a noble cause. What a travesty! Click here to read the full column. And if you think HSUS’s financial malfeasance warrants government action, feel free to follow Rep. Sacia’s advice and contact the U.S. Treasury Department. One of the first things we did when HumaneWatch was launched last February was figure out what the Humane Society of the United States was doing with the nine-figure collection plate it passes every year. We were surprised to learn that according to HSUS’s publicly available tax return for 2008 (the most recent year for which data was available at the time), HSUS devoted less than one-half of one percent of its budget to directly funding hands-on pet shelters. Now, however, HSUS’s 2009 tax return is also a matter of public record. HSUS ponied up a little bit more that year for local pet rescues and shelters, but it’s hardly worth shouting about. In all, HSUS shared less than 0.8 percent of its money with pet shelters in 2009. Some of those shelters share the “humane society” name with their richer (distant) cousin, but the vast majority of pet shelters in the United States received nothing. It’s also interesting to note that HSUS did give away over five percent of its budget in 2009. But less than 15 percent of what the group distributed made it to a hands-on shelter organization. Much of the rest went to subsidize the previously “insolvent” Humane Society International ($2.75 million), and to run political ballot initiative campaigns, including those in Missouri ($450,000) and Ohio ($1.5 million). HSUS does deserve credit for a single grant of $284,625 for the construction of a new pet shelter in Louisiana’s St. Bernard Parish. But that grant accounts for 30 percent of all its shelter giving for the year, and sadly, this sort of giving is the exception, not the rule. We’ve posted HSUS’s accounting of its 2009 outgoing grants—with the shelter grants highlighted—so everyone can see our math. Feel free to quibble in the comments section below. It will surprise many of you to learn that the Humane Society of the United States isn’t primarily in the business of funding humane societies. HSUS has historically considered these “societies” to be part of its “constituency,” but it’s not funding them with any sense of urgency. And in the meantime, HSUS’s $191 million endowment (part of which is invested in the stock market) continues to earn money hand over fist. That’s an excellent question. The 6 to 8 million dogs and cats entering shelters this year (according to HSUS’s own estimate), and the people who care for them—and sometimes have to euthanize them for lack of space and funding—are entitled to an answer. Note: The table above reflects updated numbers. If you’ve seen the Humane Society of the United States’ new TV ads, you already know they’re bursting at the seams with pictures of dogs and cats. That’s the image HSUS wants to present of itself, because cute candids of Fido and Fluffy are the best way to get pet lovers to donate money. The result, as we’ve shown time and again, is that most HSUS donors are misinformed about what the organization they support actually does. Too many Americans—donors and non-donors alike—mistakenly think HSUS is a pet-shelter umbrella group, when it’s actually an animal rights organization akin to the better-known PETA. Here’s something else HSUS’s ads don’t tell would-be supporters: A large chunk of the $19-per-month pledge pays for lobbyists instead of pet shelters. HSUS spent, according to its own tax returns, $17.3 million lobbying governments between 2005 and 2009. Though that averages out to only around 3.5 percent of HSUS’s budget, it’s far more than the group shared with hands-on pet shelters. This is a far cry from saving the dogs and cats in HSUS’s ads. While $17.3 million in lobbying expenses over five years may not sound like much for a group that raises $100 million every year, it’s instructive to put HSUS’s lobbying expenditures in the context of other charities. HSUS spent a little over three percent of its 2009 budget on lobbying. That’s significantly more than the American Red Cross (0.02 percent), the St. Jude Children’s Research Hospital (0.01 percent), or the Juvenile Diabetes Research Foundation (0.14 percent) spent on the same. And remarkably, that $17.3 million doesn’t include the additional money HSUS-affiliated groups are donating to candidates for elected office. Data from the Center for Responsive Politics show that since 2006 HSUS’s “Humane Society Legislative Fund” and “Humane USA” PAC have combined to put more than $2 million directly into federal election campaigns. Again, as far as we know, all of this is legal. But we have to wonder just how many people watching those ubiquitous TV ads realize what a political animal HSUS has become. The Humane Society of the United States (HSUS) – a national, tax-exempt organization not affiliated with local animal shelters and the most powerful anti-hunting group in the nation – has drawn fire from a group of lawmakers who question its status as a qualified 501 (c)(3) organization. HSUS supported a ballot initiative in Missouri (Proposition B) by pouring in some $1.85 million (plus another $300,000 in non-cash contributions) into its Missouri front group’s bank account. The measure passed by a slim three-point margin and sets regulations for the state’s dog breedersm including how many dogs are allowed per facility. At the root of the issue is whether the HSUS attempted to influence legislation as a “substantial part” of its activities. (R-Missouri), Jo Ann Emerson (R-Missouri), Sam Graves (R-Missouri), and Billy Long (R-Missouri) — have requested a federal investigation into the level of funding and participation of HSUS in Missouri’s affairs. The letter follows previous letters to IRS Commissioner Douglas Shulman and Director of Exempt Organizations Lois Lerner that have resulted in no remedial action. By its own admission, HSUS spends more than twice as much on “Advocacy and public policy” than any other category of expenses. 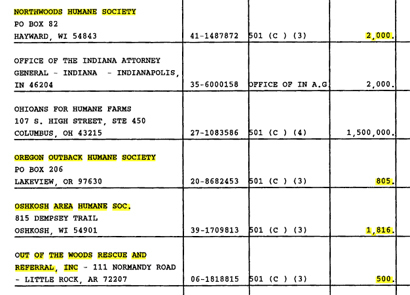 The Proposition B ballot initiative was heavily financed by HSUS. Campaign disclosure forms show that HSUS donated more than $2.1 million of the $4.8 million raised by proponents of the measure. The lawmakers also cite other efforts in numerous examples of HSUS to influence legislation by having its employees urging the public to contact members of legislative bodies for the purpose of proposing, supporting, or opposing legislation. As part of the investigation, the legislators are requesting the IRS to apply what it calls the “Substantial Part Test” to determine whether an organization has run afoul of conditions of its tax-exempt status. EDITOR’S NOTE: Glen Wunderlich is an outdoors writer for The Argus-Press. He can be reached by sending email to glenway@tds.net.